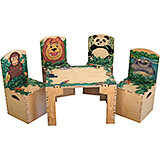 29" x 19" x 17"
Safari themed table with 4 adorable safari animal stools: Zebra, Elephant, Lion & Giraffe. This table and chairs set creates a fun and imaginative environment for children to draw, write and play! A great addition to any kid's room or play area. 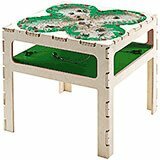 (Table is 29" x 19" x 17" and Stools are approximately 20" high) Ages 3+. 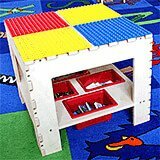 These stools are a great addition to any of our activity tables. Constructed of plywood and easy to assemble. Stools are a must to play any table game. They are the perfect size for children. 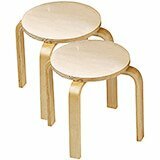 Children can take a load off their feet and enjoy these durable stools while playing their favorite Anatex games. Ages 3+. Each stool measures 12" diameter and 12" height. Natural wood finish. 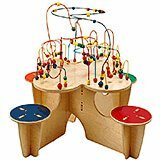 Four Puzzle Benches of Fun Activity! Puzzle benches connect together to form a Circle of Fun. Puzzle benches can also be separated for individual play. 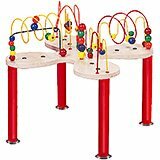 A great activity center for doctors' offices, schools, waiting rooms, and even homes. Guaranteed to keep kids of all ages entertained for hours! 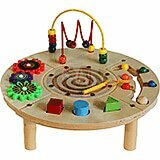 Ages 3+ 7 Award Winning Toys include: Abacus, Pathfinder, Fun Fruits to Match, Magnetic Circle Express, Gear Panel, and Sculpture Mazes #1 and #2. Shipping weight: 45 lbs. 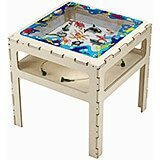 42" x 42" x 33.5"
The perfect activity table for large groups of children - up to eight can play at once! 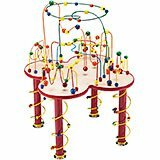 The new metal industrial strength spiral bead and wire legs along with the 15 colored wires attract children like a magnet! This table can be bolted to the floor if desired so it is great for high traffic areas such as schools, offices and waiting rooms. Ages 3+. Shipping weight: 70 lbs. Fascinating bugs come to life with magnetic wands that move them through the sand. 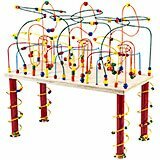 Children are endlessly entertained as they control the movements of these realistic looking ladybugs, spiders, flies, bees, scorpions and ants with the magnets attached to the bottom of the table. A true magnetic learning experience! Great for home, doctors' offices, and waiting rooms! 4 Magnetic Wands for 4 Kids! Ages 3+. 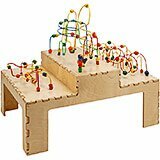 Four Puzzle Benches of Fun Activity! Puzzle benches connect together to form a Circle of Fun. Puzzle benches can also be separated for individual play. A great activity center for doctors' offices, schools, waiting rooms, and even homes. Guaranteed to keep kids of all ages entertained for hours! 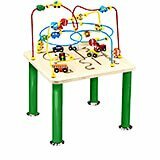 4 Award Winning Toys include: Caterpillar Pathfinder, Magnetic Circle Express, Gear Panel, and Wire and Bead Mazes. Ages 3+. 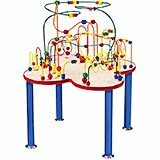 Through fun play, the Mini Curves 'N' Waves Table challenges and develops visual tracking skills, eye-hand coordination, and shape and color recognition. Great compact size for the home, schools, waiting rooms, and play areas! Not as big as the Fleur Rollercoaster Table, but just as exciting and educational! Ages 18 months and up. 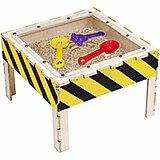 Children can explore, dig, and excavate in this compact size sand table! Yellow and black stripes on the border are an adorable accent marking the inside tub as the area for fun play and construction! Bonus shovel, strainer, and rake are included with the sand table for added play. (Sand not included) Ages 3+. 35" x 24" x 31"
An exciting and educational trip on a whimsical yellow submarine! 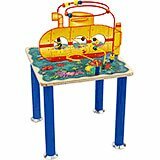 Children guide the beads along the wires, through the submarine, and dive below the waters to discover colorful reefs, exotic fish, and sea creatures. 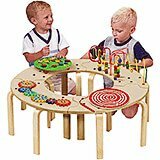 A wonderful activity table that will keep kids entertained and stimulate every child's imagination! Great for the home, schools, and waiting rooms. Ages 3+.